Take a drive along the North Sea Road, go through Setesdal, explore the Lysefjord and Pulpit Rock, and enjoy southern culture in the many villages along the coast. Follow the North Sea Road along the coast of Norway between Kristiansand in the south to Stavanger in the west, for the chance to experience skerries and fjords, and both villages and cities. A tour along the North Sea Road can be done in a day, a week or a month. There are activities available along the way, like deep-sea fishing, rafting, hiking and swimming. And why not stop somewhere when there's a festival going on or indulge in a bit of shopping? The culinary adventures are part of the experience, whether you eat in high-quality restaurants or eat fresh shrimp sitting on a rock or a pier overlooking the sea. The Suleskar Road in Southern Norway is your chance to see the coast, the mountains and the fjords all in one trip. Starting in Kristiansand, you will head north to Valle, across to Suleskar, then follow the North Sea Road and back to Kristiansand. In Evje in lower Setesdal you will find a mineral park, a high wire adventure park, an activity centre with rafting, a wide range of other outdoor sports, and a go-kart track. The road between Brokke and Suleskar is open from the end of May to November 1. Suleskarvegen runs from Telemark in the east, across the mountain, to Rogaland in the west. The Telemark Route "Telemarksvegen", Major Road 41, winds its way through the beautiful scenery of six municipalities from the southernmost Norway to inland Telemark. On its way through the municipalities of Kristiansand, Birkenes, Froland, åmli, Nissedal and Kviteseid, The Telemark Route offers 180 km of typical Norwegian landscape. The scenery is abundant and beautiful with its smooth rocks on the salty shores, green moorland, plentiful fishing in its lakes, breathtaking waterfalls and spectacular sheer mountainsides. As a taste of Telemark on route to the fjords, or as part of a round trip, The Telemark Route is an attractive alternative. Ancient cultural heritage sites, and local art and handicrafts play a major part in the experience of traveling along this road. The holiday spot for thousands of Norwegians has for decades been "Sørlandet", Southern Norway. Drive through this friendly part and explore the villages, the local cuisine, and enjoy activities along the coastline. From Kristiansand, going east, follow the road to Oslo, and visit many small villages along the southern coast. 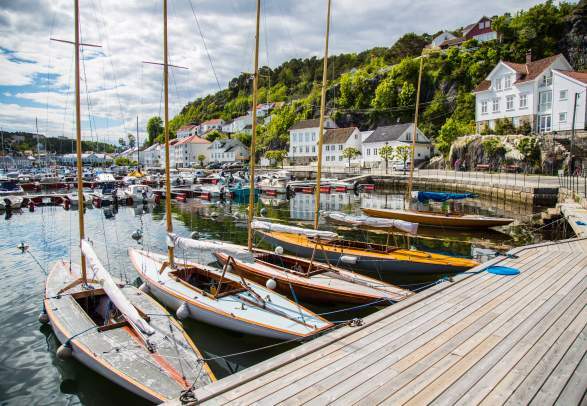 Visit Lillesand with white-painted clapboard houses by the water’s edge, atmospheric cafés and restaurants and quaint shops. Grimstad is the next town along the southern coast, this is where the Norwegian playwright Henrik Ibsen started writing. Visit the Ibsen Museum, before continuing towards Arendal. On the way to Tvedestrand stop by Gjeving and take the ferry to Lyngør, a group of islands recognised as one of the best preserved communities in Europe. Lyngør is a car-free environment with scenic harbours, narrow walking paths and charming wooden houses. Next town is Risør, famous their cultural festivals. Going west from Kristiansand towards Stavanger you can follow the North Sea Road towards Flekkefjord and further on to Stavanger. Visit Mandal, famous for the Sea food festival and make sure you have time to stop at Lindesnes Lighthouse, Norway’s southernmost point. Nearby you will also find Under - the worlds largest underwater restaurant. Stop in Lyngdal, known for viking history and “mysterious stones”, before going to the Lista region and the small towns of Farsund and Flekkefjord. The nature in the Lista region varies greatly from the open landscape, mountains and sheltered valleys with dense forest. Farsund has ten kilometres of long sandy beaches perfect for a walk, wind surfing, kite surfing and surfboard riding.